In the aftermath of writing The Death of God, Vahanian had opportunity to advance his discussion. In his introduction to No Other God, he wrote, Taken as nothing less if nothing more than a cultural phenomenon, the death of God signifies the transition from radical monotheism to radical immanentism and marks the birth of secularism as the vector of the new religiosity. It announces the the advent of a new, culturally Christian, paganism, even while theology is busy overlooking its indigence or covering it up with a glorified but amnesic vocabulary....But what I have denounced elsewhere as the charter of the incipient post-Christian idolatry is now proclaimed as the first article of an immanentist religiosity. So called 'Christian atheism' glories precisely in what I deplored when I first used the term 'death of God.' Meanwhile, Christian theology serves only to separate the Church from the world, instead of pointing to the fact that the Church is -- or should be -- what happens when the world hears the Word of God. 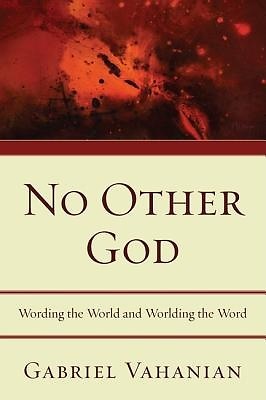 Vahanian, recognizing that God is a word, and that God is not God without the world, ultimately helps readers understand the two poles of language that need to be kept in balance: wording the world and worlding the word. In this light, idolatry of every kind is threatened by new language, both symbolic and iconoclastic, which serves to usher in a new world.